Glaucoma is a disease that causes damage to the optic nerve resulting in vision loss. It is often caused by high pressure in the eye. The optic nerve is a bundle of millions of nerve fibers that connect the eye to the brain where visual information is processed. The front part of the eye is filled with a clear liquid called aqueous which is constantly being made and then leaves the eye through drainage canals called the trabecular meshwork. These drainage canals are located inside the eye in an angle formed by the meeting of the cornea, the clear front part of the eye, and the iris. In this most common form of glaucoma, the drainage canals become “clogged” so that fluid cannot flow out, causing pressure in the eye to build up. Most patients with this form of glaucoma do not have any symptoms, and it is most often identified in a routine exam. Risk factors for open angle glaucoma include age over 60, family history of glaucoma, and it is more common in African Americans. 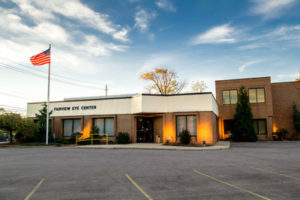 The diagnosis is made through testing eye pressure, analysis of the optic nerve with the OCT or HRT analyzer, and testing of the visual fields. This form of glaucoma is usually treated with eye drops, laser treatments (SLT), and in some cases surgery. 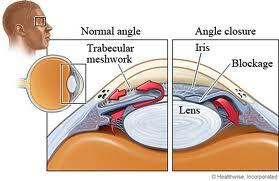 There are other diseases or conditions of the eye that can also cause elevated eye pressure and lead to glaucoma. A few common ones are Pseudoexfoliation, Pigment Dispersion Syndrome, a previous history of trauma to the eye, and chronic use of steroids. In some patients, the angle where the drainage canals are located can become physically blocked by a forward shift of the iris covering the canals. If this happens, fluid cannot leave the eye and pressure rises rapidly (Figure 1). This is a true medical emergency. Symptoms include blurred vision, eye pain, headache, and nausea. 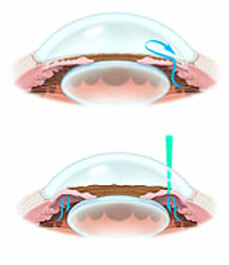 Treatment is performed with a Laser Peripheral Iridotomy (LPI). Often times, patients who are at risk for developing this condition can be identified at the time of a routine exam and then treated with a Laser PI to prevent this from happening (Figure 2). Figure 2. Laser Peripheral Iridotomy treatment creates a small hole through the iris (top picture) that allows fluid to pass into the anterior chamber and relieve the posterior pressure causing angle closure (bottom picture).